This gorgeously pretty Bear with Growler, is an exceptionally rare and sought after 36cm tall, Mohair 1999 British Collectors Teddy Bear beautifully crafted by Steiff. The 1999 BCB is fully jointed and sewn from the most luxurious wavy pile, lilac/grey mohair with rich dark lilac paw pads and hand stitched features, plus soulful violet eyes accompanying his endearingly friendly growl. 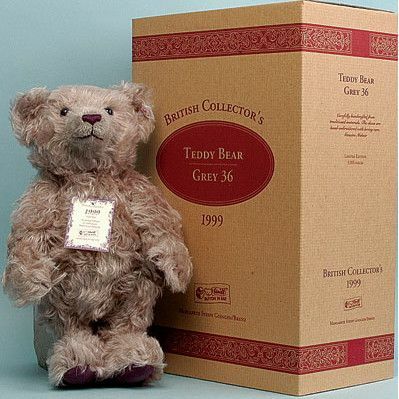 This exquisite Bear is a UK and Ireland Exclusive of just 3,000 pieces and will come to you boxed with his numbered certiificate of authenticity. Due to his enchanting and colour blended look he was highly sought after when first released in 1999, so this great find will certainly not be on our shelves for very long . . . . catch him whilst you can!